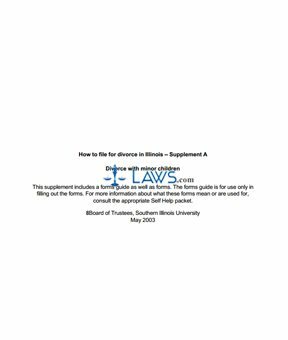 Someone filing for divorce in Illinois with minor children can obtain a packet with all the documents they require to do so from the Law School website of Southern Illinois University. This is the Illinois Divorce With Minor Children Packet which is discussed in this article. Illinois Divorce With Minor Children Packet Step 1: The first form is an Application To Sue As A Poor Person in the event that you cannot afford the filing fee for your divorce and wish to have it waived. Illinois Divorce With Minor Children Packet Step 2: The next two forms are the Entry of Appearance, Waiver and Consent a defendant will file if they do not dispute the petition filed against them and agree to cooperate throughout the divorce process by negotiating a separation agreement or submitting to a judge's ruling. The second version of this document is exclusively for military members. Illinois Divorce With Minor Children Packet Step 3: The next form is the Petition For Dissolution of Marriage that initiates the divorce process. Illinois Divorce With Minor Children Packet Step 4: The next form is the Stipulation to Waiver of the Two Year Requirement. Spouses who have lived separately for less than two years but more than six months can use this form to waive the requirement of living apart for two years before divorcing. Illinois Divorce With Minor Children Packet Step 5: The next form is the Notice of Hearing that must be sent to a spouse informing them of the upcoming court date, followed by the Certificate that must be filed with the court to confirm you have taken this step. Illinois Divorce With Minor Children Packet Step 6: The next form is a Notice of Withholding you must send to your spouse's employer once a child support ruling has been made. This Notice informs employers how much of your spouse's wages must be withheld for this notice. There is an affidavit to sign confirming you have sent this. Illinois Divorce With Minor Children Packet Step 7: The last five documents all concern child support, including letters that can be sent to a spouse's employee and the state Division Of Child Support Enforcement.